Robin Krug, Medicine Class of 2018, was raised in big-city Ontario but feels more at home among the province’s rural landscapes and small-town communities. This early exposure to rural environments sparked a love of the outdoors and a sense of belonging, something Krug is applying to her medical school experience. This summer, she participated in the Medical Learning in Community Settings (MedLINCS) program, spending six weeks living and working in the Wiarton area, including the Saugeen First Nation and Chippewas of Nawash communities. Krug shadowed a number of family physicians in the hospital emergency room and in family medicine practices. She was given the opportunity to speak with patients and conduct interviews, and also observed the types of injuries that occur in cottage country during the summer months. “I’m definitely better at identifying poison ivy and knowing what kinds of injuries result from wood splitter accidents,” she said with a laugh. Aside from these intriguing medical issues, Krug also points to the continuity of care as an important lesson from her time in Wiarton. But clinical observations were only part of her MedLINCS experience. Krug, along with two other Schulich Medicine classmates, also organized an educational program for aboriginal youth, living at Cape Croker for two weeks to lead the activities. 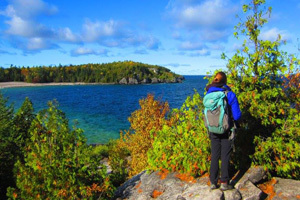 Now in her second year at Schulich Medicine, Krug continues to unite her passions for the great outdoors and helping others. She is one of three executive members of the Rural Medicine Action Group, a student interest group for medical students at the School. The Rural Medicine in Action Group organizes events and hosts lunchtime speakers, all in an effort to engage students and showcase distributed education opportunities. Their next initiative is a visit to Chatham in November to tour the hospital and meet with local physicians. Krug is also looking forward to participating in additional distributed education electives and clerkship experiences during her third and fourth years at Schulich Medicine & Dentistry.